I always feel bad, because a lot of the gardening blogs do “Harvest Monday,” but I can’t participate because we harvest most everything on Tuesday! Oh well, that doesn’t make it less impressive. I don’t know how many cherry and grape tomatoes we picked this morning, but it was a significant number. 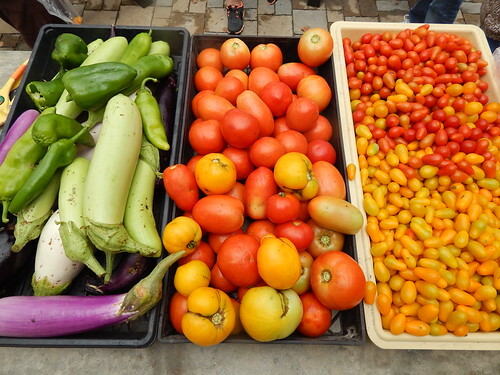 Mostly, we are harvesting cherry/grape tomatoes, Jetsetter tomatoes, eggplant (still! ), a few melons, and some peppers. You can see that we aren’t experiencing a tomato shortage here! This is pretty much ridiculous. Luckily, one of our Nutrition Program Assistants goes to teach nutrition classes each week at a halfway house for teen girls and they love the cherry tomatoes! They have been getting gallon bags of cherry tomatoes each week for the past few weeks. 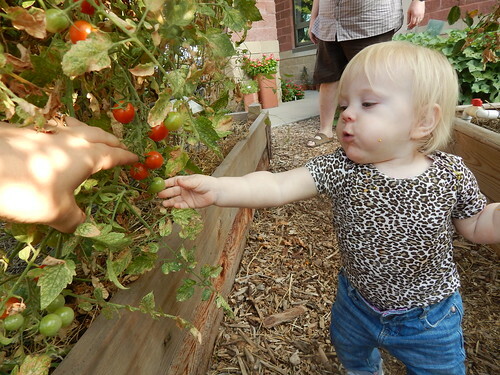 Everyone loves cherry tomatoes! (Yes, she has a tomato chipmunked in her cheek while going for another one.) You should see her eyes light up when we go under the arbor and there are tomatoes everywhere! 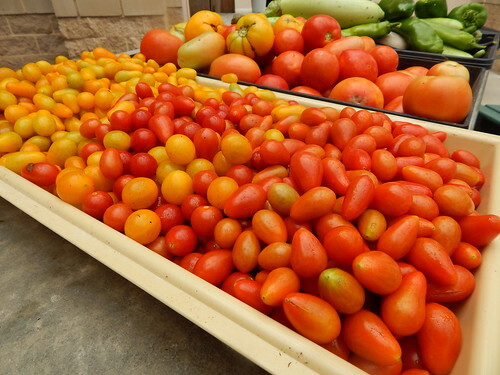 Posted on September 17, 2013, in Harvesting & Eating and tagged harvest, Tomatoes. Bookmark the permalink. 1 Comment.